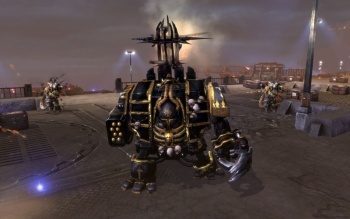 There's a lot of things to love about Warhammer 40,000: Dawn of War II, including the setting, the gameplay, the delightful levels of over-the-top violence, and the soundtrack. If you're a particularly big fan of that last line item, then good news: THQ is going to commercially release a two-CD collection of the game's music next month. The publisher is teaming up with Sumthing Else Music Works to release the game's soundtrack at "select retail outlets" (on a side note: do people even buy CDs anymore? ), as well as Amazon MP3, iTunes, other music sites (presumably like emusic) and the official website for Sumthing Digital. The album will include all the music from Dawn of War II, Dawn of War II: Chaos Rising, and Dawn of War II: Retribution; all of the music in these games was composed by "virtual orchestra maestro" Doyle W. Donehoo.